Home » What’s the best selfie stick for iphone 6 plus/s reviews? What’s the best selfie stick for iphone 6 plus/s reviews? Update: Originally, this post was written for iPhone 6 Plus. However, I would like to make clear that if you are in a quest to find a strong and sturdy selfie stick, this is the place for you. It doesn’t really limit to iPhone 6. In fact, other equivalent smartphones of the same sizes or weight, including those bigger versions do apply. Just check the specs and see if any one of the selfie sticks below will make a good fit for your smartphone. For example, if you are looking for the best selfie stick for iPhone 6s Plus, you are in the right place. Check out our best GoPro selfie sticks recommendations here. If you are reading this post, chances are you have been using selfie sticks for your iPhone 6 plus, iPhone 6 s or other equivalent smartphones in terms of weight and size. You know very well that most types of selfie stick (including those you’ve used) aren’t great enough to provide you a great user experience. The pole might break, the phone holder might detach from the pole, or perhaps the pole might bend when you attach your iPhone 6 plus on it (especially when the selfie stick is fully extended). Now, these are common scenarios whereby most users (those using large and heavy phone) have to deal with it. This is very true because most of them are made for smaller versions of smartphones which are of course, lighter. Other selfie stick review websites probably won’t tell you this, instead they emphasize on the additional features the Monopod possess. I am not saying that additional features aren’t great, they are. However, we should first ensure that the pole will be able to withstand the weight of the phone. Here, in Magical Selfie Stick, we researched and put forward 8 best selfie stick for iPhone 6 plus or other equivalent smartphones that are Sturdy, Strong and Durable besides providing other great features that I will be explaining below (though we only conduct research for iPhone 6 plus, other smartphones that fall under the same category in terms of size and weight will still be able to benefit from this comprehensive research). Also, if you would like to learn more about the benefits of selfie stick, check out this post. How we came with this 8 sticks? Just to clarify, these 8 ‘stars’ are picked based solely on one criteria, the ability to support heavy smartphones even when extended to it’s maximum length. You wouldn’t want to pay for one that have tons of great features but couldn’t even support the weight of your smartphone, would you? Of course I understand that other criteria such as Bluetooth function, weight and size of selfie stick (which contribute to mobility), and perhaps, even price really matters when considering which one to get. Therefore, later in the post below, I will be providing you with an extremely comprehensive reviews as well as comparisons to help you make up your mind. Now, before we go into detailed individual reviews, I took the effort to come up with this comparison table comprising a summary of the stats of each selfie stick. Important: Read this guideline before proceeding so you will understand the abbreviations used in the table as well as how each stats affect the quality of a selfie stick. All length measurements are in inches. All weight measurements are in ounces. All price measurements are in USD. All measurements (length and weight) are not inclusive of phone holder, only the stick alone. Max Collapse is the length of the pole when retracted completely. Max Extend is the length of the pole when extended completely. Dur. is the durability of a pole (rating given by us). PH Max Width is the maximum width of a smartphone that the phone holder can hold. Blue. is whether Bluetooth function is available. If you analyze the content in the table above, you will realize that each different selfie stick has it’s own pros and cons (of course those that are higher in price will often have more pros than cons). In order to really assist you in making a wise decision, we are going to provide you with a detailed analysis of each and every one of them. By far, this is the one that I love most as compared to others. It’s also Amazon #1 bestseller product in the Monopod category. The unique concept about this stick is that it’s to be used during extreme outdoor adventures such as jungle trekking, hiking, skiing and even snorkeling, how amazing! The whole pole is made to be rugged, waterproof as well as having high resistance towards rusting. You might be wondering, there is no point for the stick to be waterproof as your iPhone 6 plus isn’t waterproof. Yeah, you are right. These outdoor activities require more professional device, called the GoPro Camera. Anyways, due to the fact that the stick is extremely strong, it would be a good fit for your iPhone as it will definitely be able to support your phone flawlessly. In fact, it has an Amazon Rating of 4.8. Everyone seems to be happy with the quality of the stick as they commented highly on it. It works as advertised, doing a great job supporting large smartphones and cameras firmly. Although being extremely sturdy, it is still extremely easy to be brought around (high mobility). It weighs only 6.5 ounces, which is pretty light when compared to others. Also, it’s fully retracted length is only 14.5 inches which makes keeping it in your backpack convenient. Perhaps, one of the main drawback is that the maximum extended length is a little bit short, only 36 inches. If you would like to capture selfies from a longer distance, then this is definitely not your best bet. Important! If you are to check the reviews of this product in Amazon, you are to realize that most one-star ratings are due to the fact that people expect to see a Bluetooth button on the stick. I will like to reiterate once more that this selfie stick does not come with Bluetooth function as it is meant to be used in all weathers (even under water), so there cant be any electrical properties or it will be dangerous. Conclusion: I find Alaska Life© Thrill Pro being extremely great for iPhone 6 Plus users. Despite all the mentioned advantages, it’s pretty affordable in price. You get to choose from 3 colors, green, blue and black. However, if you would really want to have the Bluetooth function, you can actually pay for an additional Bluetooth shutter. Really, if you are looking for an affordable yet sturdy selfie stick, and you aren’t so particular about those fancy features, this is indeed your best choice. Simple yet great. This stick is refundable within 30 days of sale. First off, Selfie World has high durability due to the fact that it is created after iPhone 6 Plus is released, meaning to say, it is created to withstand and support big, heavy smartphones like this. The aluminum-made pole gives it the strength and durability. Another great feature that I would like to highlight is the fact that the phone holder that comes together with it have a maximum width of 3.5 inches. This means that you will not need to remove the cover on your smartphone (the width of iPhone 6 Plus is 3.06 inches) in order to fit your smartphone. Instead, you can even afford to use bulky phone covers, including those phone covers that are built together with a power bank. Bored with the normal designs? 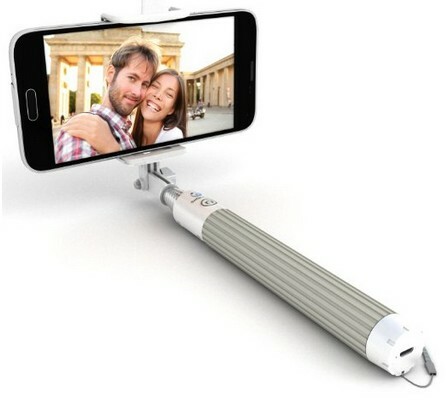 Selfie World has a pretty unique design and color which distinguishes itself from the other selfie stick in the market. Take a look at the picture above, what do you think? For me, the silver color and aluminum-made pole gives the stick an elegant and classy look. If you are the kind of person that loves elegant design, then I would say it will be the best fit for you. Besides having an elegant look, it is also built in such a way to maximize user experience. Having a maximum collapsed size of 8 inches while weighing only 5.5 ounces, it makes carrying it around no effort. You can keep it in your backpack easily without having to worry too much, it will definitely fit into your backpack without taking up much space. 8 inches is just slightly longer than a 15 cm ruler, how tiny. For your convenience, this pole also comes with an inbuilt Bluetooth button. You will just have to pair your smartphone with the stick and you are good to go. In addition, it supports Camera 360 and Snapchat. So, for those who favors these application for your selfies, this is great. One more amazing fact about this problem is that the Amazon Rating is 5 (maximum!). This shows just how much customers enjoy the product, perhaps it is very much worth the price. 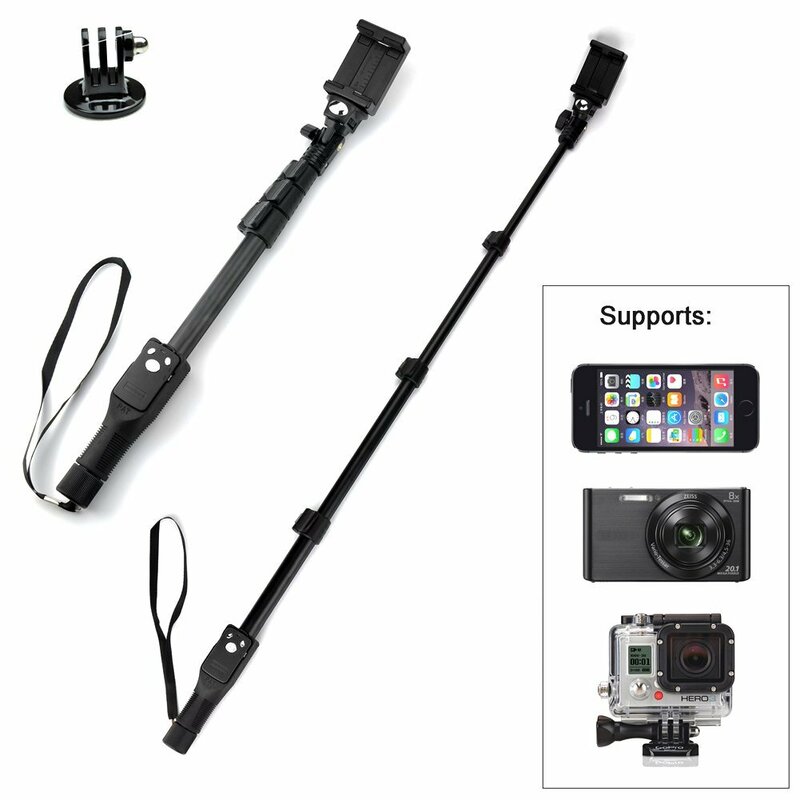 The only problem here is that the maximum extended length of this monopod is only 32 inches. I know some of you would prefer up to 40 inches, so this is something you would have to consider though. Conclusion: Selfie World® is definitely one great choice if you are looking for more functionality at an affordable price. It promotes usability as mentioned above (lightweight and compact) besides having the Bluetooth button. The product dealers claimed that they offer a lifetime guarantee for your product, refundable any time if you find that the pole doesn’t meet your expectations. Honestly, I wasn’t familiar with this stick before, it was recommended to me by one of the readers. While I was compiling this top 10 list, I find this one makes a good fit in this list as it is extremely durable and strong, so it wouldn’t have any problem supporting your large smartphones. First, Polar Pro is built solidly with aluminum providing extra support and strength. You will definitely find it safe to attach your smartphone on it. Even in Amazon, you wouldn’t find any customer’s review pointing out that the stick or phone holder broke. This is the first advantage. Next, Polar Pro is designed uniquely that it also acts as a power bank (the device you use to charge your smartphones). Knowing very well that power bank is becoming a necessary complementary item for your smartphones, Polar Pro is integrated with both ‘selfie stick and power bank’ features. It allows you to take selfies all day long as it powers up your phone while you are using it. Customers have proven that if you are using your smartphones for selfie purposes only, the battery in the stick will be able to keep your phone usable for around 7~10 hours time. These features are definitely great if you plan to take selfies to a higher level, by recording video, instead of just taking pictures of you and your friends. Check out this post that I wrote specifying some of the great ways to use your selfie stick. The main problem here is that the stick is highly priced. However, there are some minor drawbacks which makes customers feel that this stick isn’t worth the premium price. Plain design. For such an expensive price, most of us expect something special in terms of appearance. We would like designs that look classy and elegant. However, this pole only comes in one color, which is black. No Bluetooth function. With a price of $99.99, customers would expect that it comes with an inbuilt Bluetooth button to make it more convenient for photo sessions. However, as I have said, you can easily get 1 to complement this product. Other minor drawbacks. The maximum extended length of this stick only reaches around 30 inches which means that taking selfies from a distance further than 30 inches is impossible. Also, due to the solidly built foundation, the stick weighs at 13 ounces, which is a little bit heavier than others. The maximum retracted length is slightly longer at 19 inches. These makes carrying it around troublesome as it is long while retracted and heavy. Conclusion: Well, depending on what you find it important to have in a selfie stick. If you are amazed by the ‘selfie stick and power bank’ feature, then I would say it’s worth the price for an extremely sturdy and strong stick as well as being able to charge your phone while using it, two in one. Or else, you would rather go for others which comes with better features such as an inbuilt Bluetooth button at a much lower price than this. The choice is yours to make. Other than just being sturdy and strong like the other products mentioned above, Accmor (TM) allows you to fix any desired length by using the quick flip lock feature. This great feature allows you to enjoy a firm product basically at any extended length you favor. This way, you get adjust the pole to get the best distance for your selfie session. On top of that, it comes with a maximum extended length of 50 inches, incredibly long. This unique feature (that doesn’t present in most product) makes it great for those who loves to take group selfies from a great distance. It makes room for more sophisticated shot. The next thing that is worth highlighting is the professional layout of the selfie stick. The whole pole looks like a professional gadget that will in turn makes you look like a professional. Just take a look at the diagram above and you will see just how unique the design of the stick is. In addition, the look of the inbuilt Bluetooth button is much more professional than other products. As mentioned, this stick comes with an inbuilt Bluetooth button which have a life of 10 hours. There is no need to replace the battery as it is rechargeable. This way, it is very much more cost effective and less complicated compared to those where you need to replace the batteries. The maximum extended width of the phone holder is 3.34 inches. So, you don’t have to worry about your phone casing as I believe your iPhone 6 Plus with the phone casing can both fit into the phone holder. This product has a relatively high Amazon Rating of 4.7 which gives you an insight about the quality of the product. So far, no complaints made pointing that the stick or phone holder broke. Like other products, Accmor (TM) comes with some setbacks. The maximum retracted length of the pole is 18.5 which is fairly long. It makes keeping in the backpack a little disturbing. You have to make sure that the backpack is big enough or else it would not fit. Also, it weighs around 17 ounces which makes it a little heavy to be carried around. Adding to that, when extended to the maximum length with your smartphone on it, it might turn out to be less comfortable due to the heavy weight. Conclusion: This stick isn’t that unique as compared to all the above selfie sticks. However, for it’s affordable price, getting this all-rounder product might be a great choice especially if you like the professional design that comes with it. Also, it has a relatively great extended length for distance selfies. CamKix is an extremely well-known brand in this product industry. By far, it has the most customer’s reviews in Amazon which amount to 1700+ of them with an average rating of 4.5. I would like to recommend this product in this top 10 list as it clearly differs from the others. Before going on, I have to say that this product isn’t made to be extremely strong. Even in the table above, I highlighted that it has a score of 9 under the durability column. While this is true, most customers (including those iPhone 6 Plus users) seems to be happy with the stick. Let’s move on with some of the great features. CamKix has a high range of length with the maximum extended length of 40 inches and the maximum retracted length only at 11 inches. 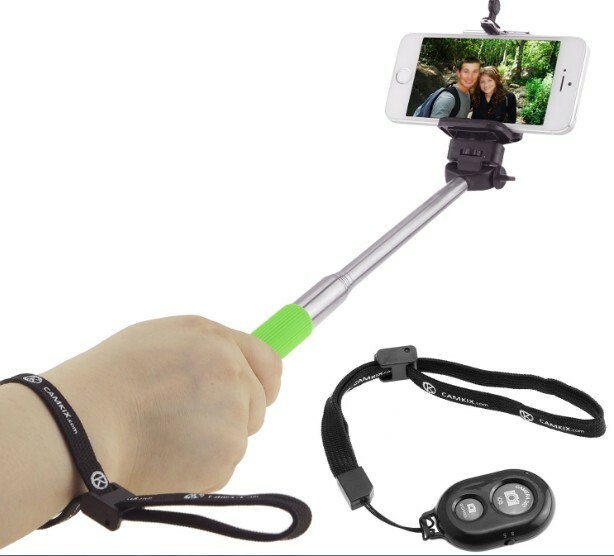 For those of you who wants to have a longer distance of selfie while maintaining the convenience of carrying it around in your backpack, this is definitely something you sought for. In addition, this product weighs 8 ounces only. In terms of design, I wouldn’t say that it has any classy or professional look. However, it comes with 3 beautiful colors which will definitely appeal to many of you (especially those of you who loves colorful stuffs). You get to choose from one of these, black, green or pink. Also, this selfie stick comes with a remote shutter. This is a separate device, not like those inbuilt Bluetooth button as mentioned above. So, if for any reason, you do not like the inbuilt Bluetooth button but you want the Bluetooth function so badly, perhaps CamKix will be your great alternative. Conclusion: There isn’t really much specialty to elaborate further about this stick. What I can say is that this stick is quite sturdy (not extremely sturdy) and comes with some of the basic features. I believe it is extremely reasonable especially if you are not demanding and are on a tight budget. 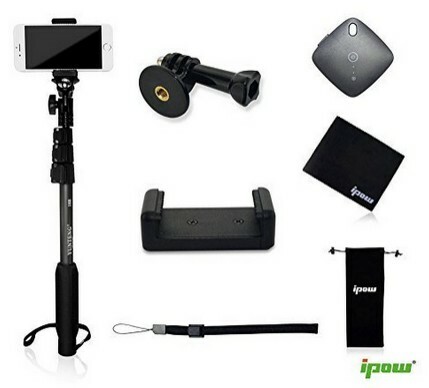 Note: The main reason for me to include this product in this list is due to the fact that I know some of you out there would like to stick to a low budget when sourcing for great selfie sticks. While I wouldn’t recommend this stick for iPhone 6 Plus users, you can definitely give it a try as many customers have proven it’s quality. If you have more to spend, I really encourage you to get a better one, or at least, a stronger one. This one that I am recommending is the improvised version of the first one that I reviewed before. It was made to be much more stronger and sturdier with aluminum built body. So, it will definitely have no problem supporting your iPhone 6 Plus firmly. So, what’s unique about this product? 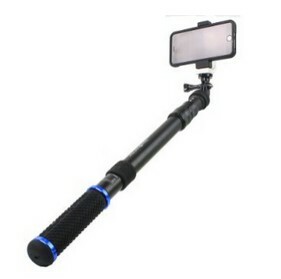 It comes with a lot of other extra items complementing the selfie stick. It’s more like a package designed specially for a selfie enthusiastic rather than just selling a plain monopod. Now, lets see what are you getting in this package. Two types of phone holder. Now, this is special. In the package, there are two different types of phone holder with one of them having a maximum extended width of 3.46 inches. Smartphones like iPhone 6 Plus including the casing cover will definitely be able to fit into it easily. Besides, changing between the two types of phone holder gives you the choice to pick one that matches the design of your device. Unique Bluetooth remote. This product comes with a sophisticated Bluetooth remote which looks very different (and beautiful) as compared to the various Bluetooth remote out there. The appearance of the remote looks very much more classy and professional. According to the picture above, the diamond shape one is the Bluetooth remote. Cleaning Cloth. I know you might be thinking, you can get a cleaning cloth anywhere. However, it’s cool to have a cleaning cloth dedicated just to clean your selfie stick and your smartphone. It’s not just any cloth, it’s a cloth that wouldn’t scratch your devices. Remember not to use a tissue paper to wipe your devices! Other Stuffs. The package also includes a safety string and pouch which is quite common (other products do offer similar stuffs that comes with the pole). However, when you combine these stuffs together, you get a premium set of tools which looks extremely cool and professional. With a weight of only 7.5 ounces as well as maximum retracted length of 16.7 inches, it’s extremely convenient to be brought around, either handheld or keeping it in your backpack, both works. The maximum extended length of this product is fairly long, reaches 48 inches. For those who seek for both, convenience and distance selfie, then probably this product meets your expectations. Conclusion: The whole package is extremely worth as it includes many other functional tools rather than just a selfie stick. The only drawback for this product is that you would like to have an inbuilt Bluetooth button rather than a remote shutter. If that’s the case then you can go for other great products in this list. Remember how I feel about the design of the sticks above? Classy and professional? Now this one is definitely above all products in this list if we are talking about classy designs. Look at the picture, it gives you such an appealing appearance that distinguishes itself from the others present in the market. Well, of course appearance isn’t everything. This construction of this pole is extremely strong and will definitely be able to support your iPhone 6 Plus (or other heavy and large smartphones). Furthermore, it applies the twist-to-lock technology where it allows you to fix the length of the pole at any distance. Most of other products (including those in this lists) use the clipping technology. Both are great, but I personally find twist-to-lock a safer approach. In addition, this stick has an unique inbuilt Bluetooth button. Besides having a sophisticated design, it also has an extra button, the power saving button. This allows you to preserve the battery life when you are not using the stick. For reference, look at the diagram above. In terms of mobility, this pole has a maximum retracted length of 13 inches and weight of 9 ounces. I don’t think there would be any difficulties carrying it around with you. Also, the maximum extended length is 38 inches, fairly longer than other sticks in the market. Another amazing fact about this product is the Amazon Rating of 5. This is great as it perceived to be a product that poses no problem at all to it’s consumers. While this product is great in many ways, it also has one major drawback. The maximum extended width of the phone holder is only 3.10 inches. This means that you might need to remove the casing (if the casing is too thick) on your iPhone 6 Plus if you want to make it fit into the phone holder. Slim casing should be fine as the width of iPhone 6 plus is 3.06 inches. Conclusion: Overall, I find this selfie stick has the best design compared to all the others reviewed in this list. If you are the kind that fancy appearance, I believe you will find this selfie stick extremely appealing. Also, it comes with all the basic necessities besides being extremely strong and sturdy. Let’s start off with the unique feature of this stick. This pole has a comprehensive inbuilt Bluetooth button. It’s not just any inbuilt Bluetooth button nor just beautiful design like the Hat Tm Monopod reviewed above. It comes with more than just the picture-capture button and power-saving button but also a button to control the shutter from the grip. In addition, there is no need to replace the batteries in the stick. It is built to be rechargeable with a micro USB port at the bottom of the stick. The battery life of the stick is around 7-8 hours which is considerably long. Like the others, the body of the stick is solidly built with aluminum which is strong enough to support heavy phones. The maximum width of the phone holder is 3.3 inch which can fit most phones even without taking off the external casing. One of the great feature of this product is that it has a good range of length between maximum retracted length and maximum extended length. It’s pretty convenient to be brought around as it’s maximum retracted length is only 8 inches. However, it can be extended up to 40 inches which is quite a favorable distance among selfie enthusiastic. In addition, the weight of the selfie stick is only around 8.5 ounces, pretty light. In terms of design, I find the handle part of the stick unique. It looks much more professional compared to other ordinary selfie sticks. It’s definitely comparable to Hat Tm, however I still find Hat Tm being slightly nicer as compared to Polaroid. Conclusion: Polaroid is a premium selfie stick looking at the benefits it offers. 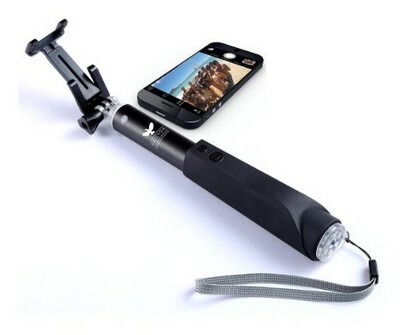 If you are keen to get a better monopod with great features, this is probably one of the best I would recommend. As you can see, I had put forward 8 distinct types of selfie stick. While they are different in many ways, they do share a common characteristic. They are all sturdy, strong and proven to be able to support large smartphones such as iPhone 6 plus. So, how should you be choosing one from the 8 of them. What is my budget? 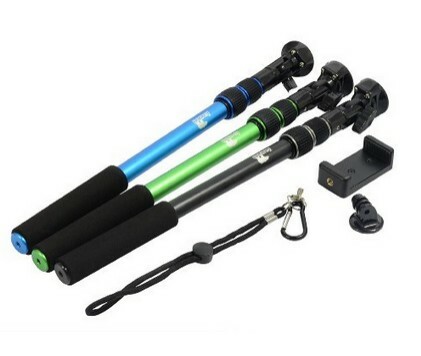 How much are you willing to spend for a Monopod? Definitely all of us would try to pick one that satisfy all of our needs at a low price. However, when you are constrained to a budget, what are the most important features that you would like to have in that stick? What features are important? You have to make sure you know what you want. For example, if you find the power bank feature extremely important, perhaps Polar Pro is your best choice. However, for some individual, this feature seems to be less important. Instead, an inbuilt Bluetooth button is a need. If that’s the case, no point going for Polar Pro, go for those listed in this list that are within your budget. How important is the strength of the pole to me? Now this is a good question. As you can see, some of the pole above are slightly stronger than others (although they have a durability score of 10). Use Polar Pro as an example. Clearly, it is extremely durable and long-lasting as compared to others. However, it lacks of other features that should be present in a premium product (it does have the unique power bank feature). So, how much do you value the strength of the product? Is this product worth it to you? Side note: Personally, I find that the strength of the product extremely important, especially if you are mounting something precious such as iPhone 6 plus or other expensive smartphones, cameras, etc. If the strength of the stick is low, it will not take long for the stick to break into parts, the phone holder to crack, more and more. Yeah, if you bought the product from Amazon, they allow you to return any faulty products and will either replace a new one or refund it fully for you. However, this is time consuming and may spoil your plan, say for example, you need to use it during your coming holidays but you have to wait for a new replacement. The main problem, however, is that you risk your expensive device on a weak item. If you lose the stick, it’s okay, it just cost you the most $99.99. What if your smartphone crashes with the stick? How much are you losing? Easily $1-2k. Many of them out there faced the exact same problem but it is just a little too late. Therefore, in my opinion, other features that complement the item is useless if it’s not durable. My advise, pay a little more to get a stronger stick. If you need those extra features such as an inbuilt Bluetooth button, just pay slightly more and you are good to go. This comprehensive list of the best selfie stick for iPhone 6 plus has all the unique combinations of features as well as price range to suit your individual preference and budget constrain. By the way, I really hope that you find this list as well as the review guidelines useful as the completion of this whole list took me around 40 hours from researching the products to writing them down in this post. While I am confident that this list covers most of the strongest selfie sticks you can find, I know I missed some along the way. For those of you who are using other selfie sticks than the ones stated above and you find it flawless for your smartphones (especially large and big ones like iPhone 6 Plus), please don’t hesitate to share it in the comment area below. I will conduct further research about that product. Who knows, maybe that particular one will be a greater alternative to other readers. Also, if you happen to buy any of them listed above, please share with us your experience. Tell us about the quality, strength as well as the flaws present in them. I really want to make this a great resource for all of you in terms of choosing the right selfie stick. I hope you will be more than happy to assist me in this goal. Share! Lastly, I would really appreciate if you could kindly share this posts in social media through any channels such as Facebook, Google+, Twitter or any of them. It’s actually quite easy to do so. Just click on the social sharing buttons on your left. Who knows, maybe your friend might be interested too. Thanks for sharing and I’ll be back! I want to use a selfie stick (or other handle) for reading books on my iPhone 6+. Are there any that can be mounted vertically rather than horizontally? The iPhone 6+ is too large for me to hold comfortably for long periods. Thank you. Wow that’s something special. What I would recommend you to check out are selfie sticks with phone holders that can be rotated. That way, you get to hold your iPhone 6+ vertically. Otherwise, you might check out devices that will hold your phone for you (but it only applies when you have a place to put the holder). Thank you, Shaun. That is a great suggestion! I will try it and let you know! I bought the Sundix on Amazon. Although it rotates it’s still not vertical but it works well enough. So thank you! Haha, I am glad it works out for you. I suggest you to get something sturdy and strong since you are going to need the strength to support the phone (you are using it for a long time right?). i recently bought a pocket selfie bluetooth selfie stick but it wont take photos for me. it has paired with my phone but when i set my phone on the stick and press the photo button nothing happens. once i did get a meesage on my phone screen which said “cannot zoom in this mode” it still didnt take the photo. what am i doing wrong? First of all, what’s your phone model? Also, try to install camera apps like Camera 360 and try once again. Hey, you should definitely check out our top recommendations for selfie stick. That’s an interesting point. In your case, you want to search for selfie stick that allows rotation on the joint point. You still need to do re-adjust though if you are constantly changing between rear and front camera.